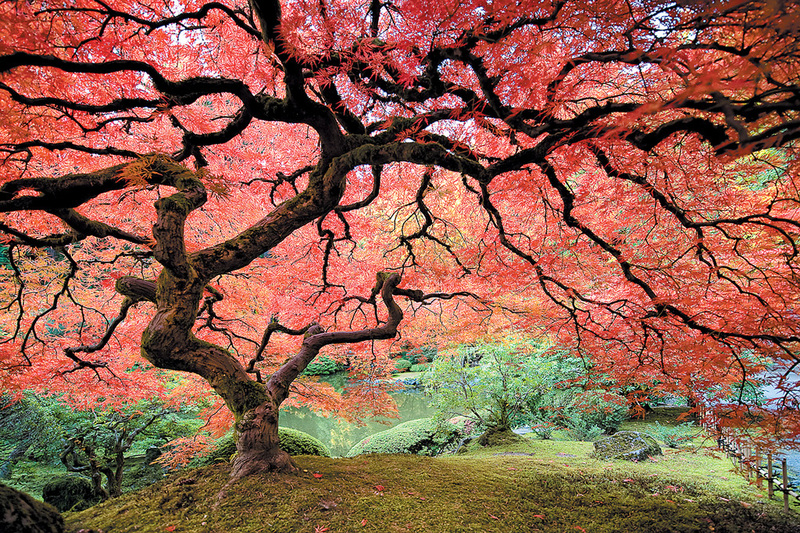 Japanese maples are among the most rewarding trees to prune because of their shape and the wide vocabulary of their branching structure—from the strongest limb to the most delicate twig. The graceful flow of the trunk, delicate leaves flickering in the wind, translucent in light, the beautiful colors. . . . From the first time I saw one, years before becoming a garden designer and aesthetic pruner, Japanese maples found a special place in my heart, as they have for many others. What some may not realize is that artistically and scientifically informed pruning can make all the difference in how much of their refined essence reveals itself to us. 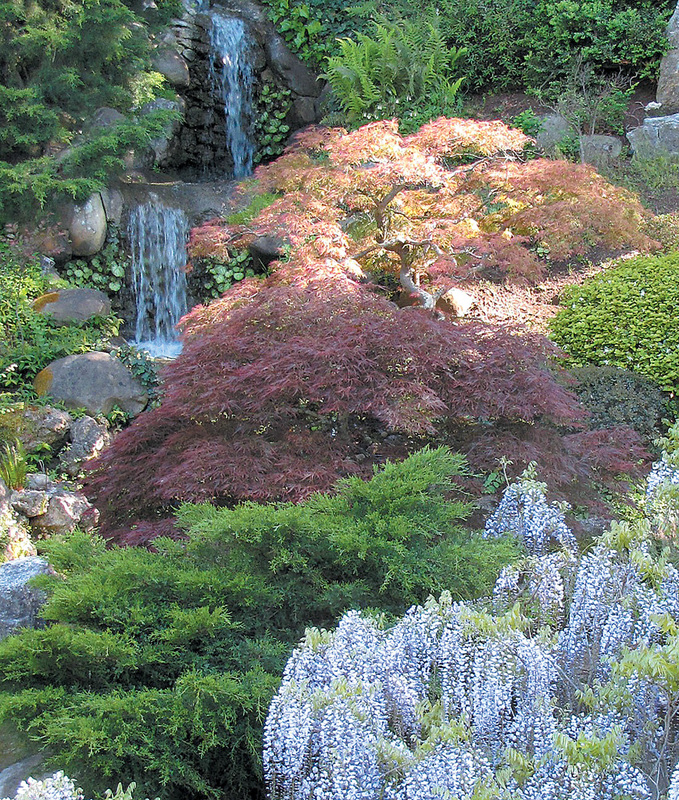 Entry into the world of garden design gave me the opportunity to design with Japanese maples. These beautiful trees can be incorporated into gardens of almost any design, whether in the ground or in a container, with careful attention paid to composition and microclimate. Japanese maples (Acer palmatum) are available in hundreds of cultivars that offer a variety of forms and a wide range of colors. Here in the West, they do extremely well and are remarkably adaptable. They thrive in the varied microclimates of Northern California and the Pacific Northwest (there are many growing grounds in Oregon and Washington), and even do well in Southern California, although they are seldom happy where they are subjected to persistent coastal winds nor the dry heat of the desert. Since their root structures are not aggressive, they can be planted in the ground near structures. They love partial shade (especially in the afternoon) or full shade, but some cultivars do well in direct sun, provided they receive enough water. They love a place with four distinct seasons, but also have adjusted well to more moderate climates, such as found in the San Francisco Bay Area. As with many deciduous plants, the more distinct the seasons, the more intense the fall color. Pruning has always been an integral part of my design work. To an artist who also works with cutting, ripping, and sculpting handmade paper, pruning feels completely natural. Researching the internet one day, I came across “Finding the Essence of a Tree.” Those words spoke to something deep inside. A whole new field of study was revealed: the art and science of aesthetic pruning, taught at Merritt College in Oakland, California. For a spatial designer, placement, line, form, depth of field, color, and texture are all important considerations; aesthetic pruning offered a deeper involvement in these aspects of garden design, as it addressed the health, structure, and design of trees and shrubs. Does each individual tree have its own character, its own essence? Aesthetic pruning’s answer is an unequivocal yes! The shape, color, and texture of the trunk, leaves, branches, flowers, fruits; the overall shape of the tree; the direction of the branches and their placement on the trunk; the growth habit (partly affected by exposure to the sun); the way the tree grips the ground . . . all are a part of the tree’s essence. Revealing the beauty of that essence is what aesthetic pruning is all about. 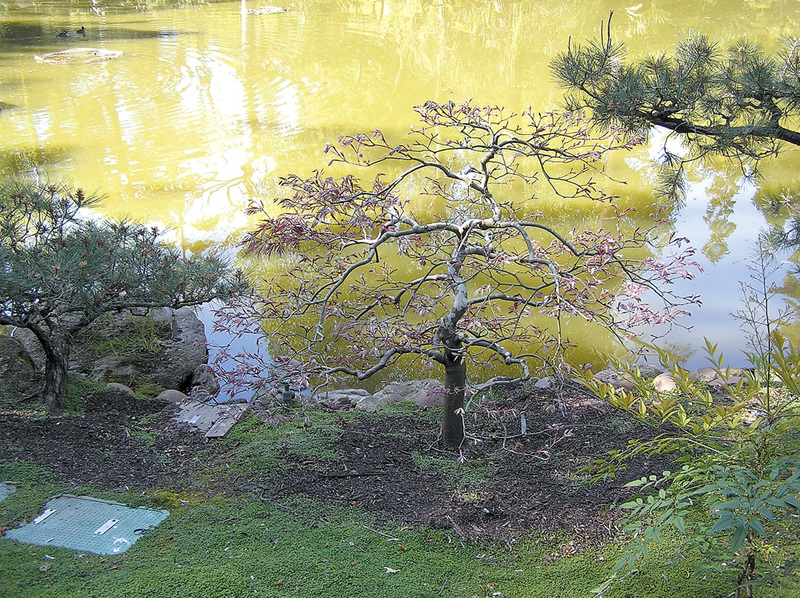 Aesthetic pruning borrows some principles of bonsai training, but applies them to natural-sized trees, pruning them to fit their particular environment. A natural looking and graceful tree that expresses its own essence and fits well in its space is the aim of aesthetic pruning. We often complain that our modern lives are too complicated. A tree can have similar problems. It may be too thick with leaves that mask the structure and the beauty of foliage or flowers. In addition to dead branches that need removal, there may be unnecessary living branches that detract from the tree’s beauty. It may have more than one apex (top-most part of the tree). The job of an aesthetic pruner is to envision the tree without these complicating elements, and to simplify it—revealing the beautiful design already within the tree. At times, this can entail a major restructuring; at other times, a gentle touch. Trees and shrubs can be thought of in three distinct ways depending upon their function in the garden: background plants, middle-ground plants, and focal points. Many of the same principles apply in each situation, but plants used as focal points get the most attention and definition in aesthetic pruning. 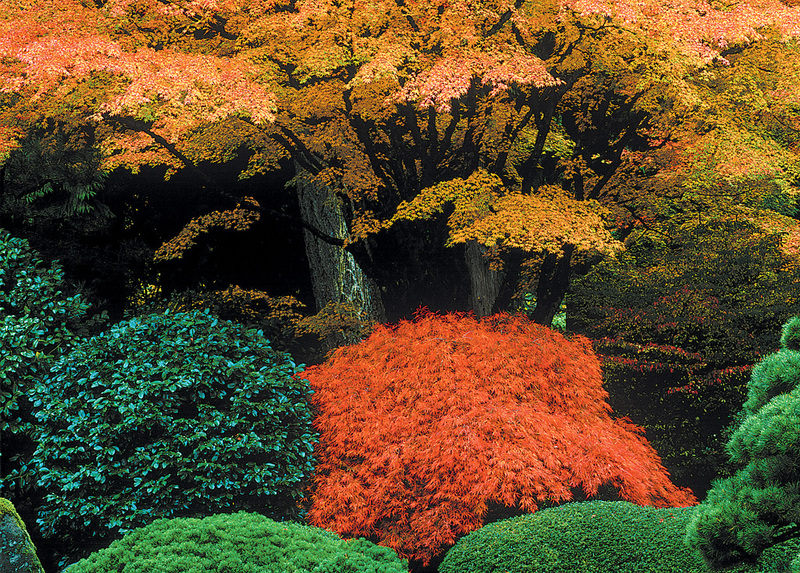 Japanese maples are almost always a focal point or feature of a garden. Using the analogy of a movie, if each plant were pruned as a star or main character, there would be no differentiation between the weight or importance of the characters; it would just be one big group of individuals vying for attention. The concept of background, middle ground, and focal point fosters a peaceful feeling, with all players cooperating and playing their appropriate roles in the garden. Aesthetic pruning is usually reserved for well-established trees that are not too young. Little to no work should be done on baby trees; give them time to develop, to find their own way. Pruning can begin when trees have grown for two to five years. The first step in an aesthetic pruning assignment is to become familiar with the tree. Look at it from all angles, including from behind, from underneath, and from within the canopy. Identify redundant or superfluous branches and excess bulk, and envision the tree without those offending elements. Piece together its history to understand what its needs are now and how it might develop in the future; note previous pruning work and any old cuts that need to be tidied up. Consider its age, how it was planted, how the elements (wind and sun) have affected it, and its overall health. Does it need more or less water than it is getting? Ask a lot questions. Determine what would work best, over time, for the design and health of the tree, and would best suit the space it inhabits. Always think about the future. We’ve all seen trees that have been abruptly pruned mid-branch or trunk, and trees that have developed unattractive “knuckles,” the result of incorrect pruning. Knuckles interfere with the concept of “coarse to fine,” a primary principle of aesthetic pruning that describes a desirable taper in branches and trunks—the gradual progression from thick at the base to fine at the tip. This tapered transition is key to a beautiful tree. There are defined periods in the year for undertaking specific kinds of pruning work. Winter, when trees are dormant, is best for some work, whereas late spring, after new growth has developed and while trees are filled with vitality, is best for other work. With good judgment, however, some pruning may be done at most times of the year. Be sensitive and aware of what would be preferable for the tree at any particular time; it is best not to prune in early spring, when leaves and bark are tender, nor in the full heat of summer. 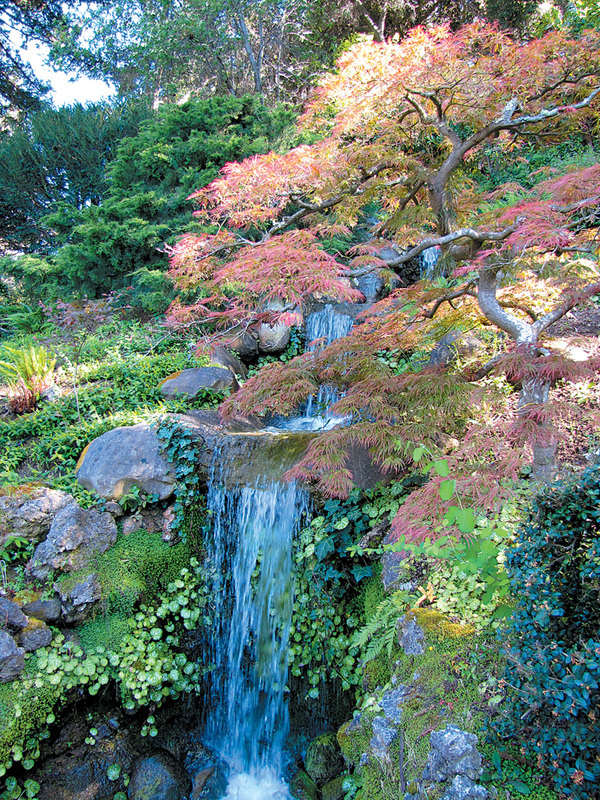 Japanese maples normally grow at a moderate rate and are well-behaved trees (unless in full sun). They do not need continual maintenance aside from two, possibly three seasonal pruning sessions a year. Aesthetic pruning has a different focus and purpose in each of these seasons. The winter silhouette is still visible, although spring leaves are beginning to burst. Notice the branch transition from coarse to fine. The delicate leaves of lace-leaf Japanese maples, such as this one, are more susceptible to sunburn, so they are best placed where they will receive shade, especially in the afternoon. Winter is the time for structural pruning of Japanese maples. Most, if not all, of the leaves will have dropped, leaving a gorgeous (or potentially gorgeous) “winter silhouette.” The tree is dormant, the bark is less tender, and large cuts heal more quickly during this season. This is when we can actually change the architecture or the lines of a tree in significant ways: to reveal more of its essence, to resolve a spatial problem (because the tree is too big), to enhance the surrounding environment (such as training around an entry way), or simply to make a more beautiful and healthy tree. Spring is predominantly a time for shaping and thinning, particularly to create that lacy, leaves-dancing-in-the-wind look. New layers of bark are tender and rip easily, so it is important to be careful with cuts and saw work, and to avoid pruning off large branches, unless absolutely necessary for the health of the tree. Focus on the finer pruning tasks: thinning crowded branches, shaping, and thinning out leaves (by hand or with scissors). When finished, the tree will have fewer leaves, but the leaves will stand out more, and the tree will appear more delicate, fresher, and better shaped. You should be able to see light coming through the tree, which will enhance a sense of spaciousness and depth in the garden. Pruning may or may not be necessary during the warm days of summer. This depends, in part, on whether the tree receives a lot of direct sunlight. Summer pruning is usually limited to removing aggressive water sprouts growing straight up through the tree. This is not the best time to do other types of pruning on Japanese maples. Try to develop an intuitive feeling for your tree before you begin to prune it. Stand back and look at the tree from all sides. Walk all around the tree and observe how it is currently growing. • Can you see the trunk? Does it curve? Is it straight? • Does the tree have a clearly defined apex? Is there more than one? Would another branch be a better choice than the current apex? • What color is it? What texture? • Are there any signs of ill health? Are there stakes around it or plant ties? Are they necessary? Are they rubbing or cutting into the bark (in which case they should be removed immediately and re-staked or tied only if the tree still needs staking)? • How are the roots? Can you see the top of the root ball? Are the roots slightly exposed or was the tree planted too deeply (a major cause of disease and death)? • Was it planted on a mound? How does the tree grip the ground? • How much sun/shade does it get throughout the day, seasons? • How close is it to the next plant or structure? • What variety is it? How wide and tall is it expected to get? Next, look from within the tree, from the ground up into the canopy. • What is the branching structure like? Does it need to be simplified? • Are there any dead branches? • Are there any crossing branches? If so, is it the typical habit of the tree? Are any branches rubbing against each other? • Are there spaces between the branches, allowing the leaves to dance in the wind? • What shapes do the branches form? Is the tree thick with leaves? Does it look like a compact bush instead of a tree? 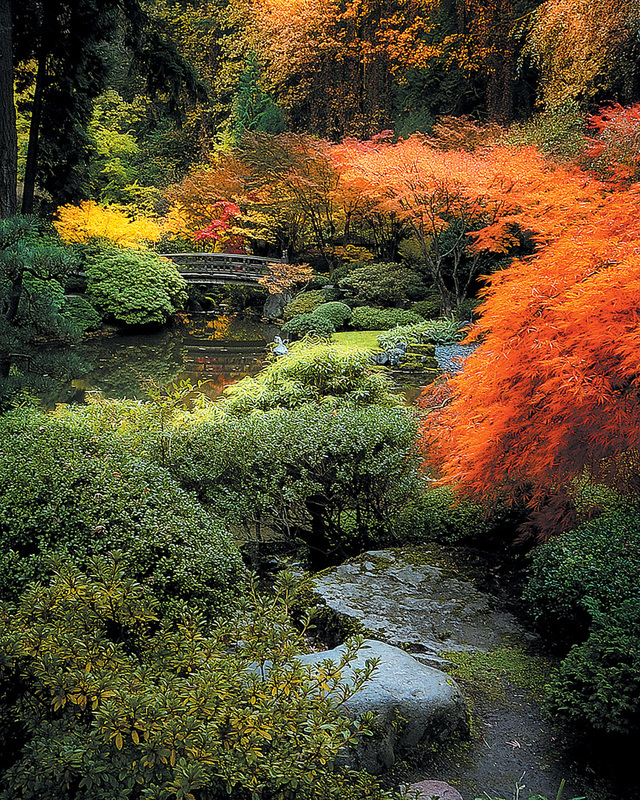 Exemplary in their response to pruning, Japanese maples are hardy trees, readily adaptable to a range of soil and climatic conditions. They thrive in gardens from the rainforests of the Pacific Northwest to the heat of Southern California. Besides thoughtful and seasonal pruning, they ask for little: regular water, well-drained but moisture-retentive soil, and a periodic replenishment of compost or mulch. Undemanding in their care, they are one of the most exquisite and treasured of garden trees.